Welcome to the latest in a series of posts looking at minor countries in the game Hearts of Iron IV by Paradox Entertainment. 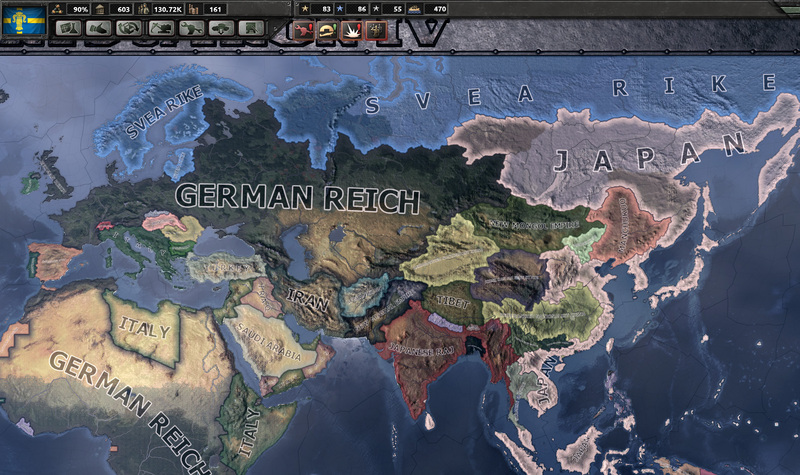 Hearts of Iron IV is an epic historical simulator that allows you to experience the Second World War as any country, and perhaps, change history. These articles examine the benefits and drawbacks of playing as any of dozens of minor countries in HOI IV. This week I’ll be looking at Sweden. Sweden starts the game in 1936 with a neutral democratic government led by Per Albin Hansson, with the national spirits of En Svensk Tiger and Neutral Foreign Policy and national unity of 90%. En Svensk Tiger grants +10% to ideology drift defense and +10% to foreign justify war goal cost. Sweden has a volunteer military, civilian economy, and an export focused trade law. Its ruling party, Sveriges socialdemokratiska arbetarparti, has 75% popularity. The fascist party, led by Sven Olov Lindholm, has 3% support, the non-aligned party, led by Axel Pehrsson-Bramstorp, has 14%, and the communist party, led by Sven Linderot, has 8%. In terms of industry, it has 3 military and 10 civilian factories, 3 naval dockyards, plus 14 additional open slots, 4 aluminum, 202 steel, 40 chromium, and 70 tungsten. Minister Ernst Wigforss, a captain of industry, grants +10% civilian factory, infrastructure, and refinery construction speeds. With all industrial techs and National Focuses researched, Sweden will have a maximum of 68 unlocked building slots. Sweden has a well-rounded military and strong navy. It has 11 infantry and 1 cavalry divisions, 9 heavy cruisers, 2 light cruisers, 6 destroyers and 10 submarines, and 36 close air support planes, 30 fighter planes, and 12 carrier naval bombers. It has 9,560 manpower initially available for new units, and two generals available to command your troops. General Erik af Edholm has a skill level of 4 and is a hill fighter, granting him a +5% movement, and +10% attack and defense in hills. General Folke Hogberg has a skill level of 3 and is a commando, granting him a -50% out of supply bonus. Sweden also has one admiral initially available: Claes Lindstrom, skill level 4. Admiral Lindstrom is a blockade runner, which grants a +20% to retreat decision chance and +25% to fleet speed while retreating. Sweden starts with only 3 research slots, but it has more technology researched than most minor countries. It has Infantry Equipment I, Engineer and Recon Company I, 1934 Artillery, Light Tank I, Interwar Fighter, Interwar Bomber, Close Air Support I, Naval Bomber I, Carrier Naval Bomber I, Destroyer II, Light and Heavy Cruiser I, Submarine I, and transport ships. Strategic Advantages. Sweden stayed neutral through the entire war, so no major powers will justify war goals against you in a historic scenario (unless you provoke them). Sweden is free to develop its industry and armed forces at its leisure, picking exactly the right moment to enter the war. It is also sheltered from direct conflict with hostile powers (unless Germany conquers Norway). If you develop a strong navy, it’s possible to defeat any naval invasion. Sweden’s large steel reserve also allows you to build the arms, equipment, and ships you need without having to trade away a majority of your civilian factories. Sweden also receives a high number of civilian factories from trade. Strategic Disadvantages. Manpower! Unless playing as a fascist country (which receives bonuses to its recruitable population through the National Focus tree), Sweden seems to never have enough manpower reserves for a sustained conflict. You will have to focus on quality over quantity. Swedish Strategies. As a democratic country, you cannot choose the Collectivist Ethos National Focus path. A democratic Sweden can choose to further entrench itself in neutrality, or focus on interventionism with the goal of sending volunteers to aid other democracies in foreign wars. In this scenario, I chose to focus on interventionism, bolster Sweden’s navy and air force, and actively promote democracy from a firm position in Scandinavia. I was playing a historic scenario, so WW2 happened more or less on schedule. Germany declared war on Norway and Denmark at the end of November 1939. It’s usually a coin toss whether the German AI actually conquers Norway. The war will severely restrict access to sources of rubber (almost entirely controlled by the Allies), so prepare for that by building a few synthetic refineries. At the dawn of 1944, I ran into a problem. I succeeded in quadrupling the size of my navy and also added 400 new airplanes and 4 infantry divisions, but at that point, Sweden’s manpower was completely depleted. Because Sweden is a democracy at peace, Limited Conscription (2.5% recruitable population) is the highest conscription law it can enact. I was pursuing Mobile Warfare Doctrine, which eventually allows you to research Volkssturm and Non-Discriminatory Conscription, which collectively raise your recruitable population by 5%. But I had yet to unlock those technologies. I could join the Allies and go to war, allowing me to raise my level of conscription, but I doubted my 16 infantry divisions would be enough to hold off the entire German Army and their allies. By decommissioning all 1922-model ships, I returned nearly 19,000 men to Sweden’s manpower pool. Not bad for the short-term. Sweden’s strategic situation seemed secure. Germany never invaded Norway, and Finland had embraced democracy (with a little friendly persuasion). The German Army was deep into the Soviet Union. I decided the time was right to join the Allies. Now at war, I could increase my conscription law to Extensive (5% recruitable population and +10% training time). I sent my naval bombers on a mission to strike German ports and my submarines to raid convoys in the Baltic Sea. Unfortunately, war cut off all external trade due to German control of the Danish Belts. Lack of oil ground ship production to a slow crawl. I had to get control of German occupied Denmark to free up trade. By landing 4 divisions in Sjaelland, I was able to surround Copenhagen and take the city. But, just as I feared, German divisions coming from the Soviet Union broke through Norwegian lines and headed into Lappland and I had to hastily rush troops up there to stop them. Casualties quickly mounted, and I was forced to raise my conscription law again. The contest over southern Denmark/northern Germany was brutal, with provinces changing hands back and forth for months. By August 1945, Sweden had suffered 193,000 casualties. But the German Army was starting to crumble. They had suffered 8.6 million casualties in their war against the Allies and Comintern. On December 9, Swedish forces marched into Berlin. Germany capitulated days later, unfortunately leaving most of their territory under Soviet control (despite the Red Army being nowhere near Germany). By March 1946, the war in Europe was over. Unlike previous games, when I had no navy to confront Japan, Sweden now had 2 battlecruisers, 8 heavy cruisers, 9 light cruisers, 46 destroyers, and 39 submarines, all of 1940 design or later. I decided to construct an aircraft carrier and make ready for the invasion of Japan. I never got to use that fleet. Japan surrendered in August 1949, and Sweden gained nothing but glory. Svea Rike (Fascist Sweden) Strategies. I was surprised how rapidly the fascist party took power in Sweden, given a starting popularity of only 3% and not being allowed to choose the fascist National Focus tree, but several random events helped it along. It seized power in February 1937 with only 42% support, and Sven Olov Lindholm became president. I began justifying war goals against Norway, under the assumption it would surrender once its capitol fell, which was only a short distance from the border. Annexing Norway adds 20 tungsten, 12 steel, 30 aluminum, and 2 chromium, plus 2 military factories, 1 naval dockyard, and 6 civilian factories. More importantly, it gives you a way around the Danish Belts, which will hinder trade and ship movement if under enemy control. I declared war on Norway on December 1, 1937 and they surrendered a month later. Now, in the event of war with the Allies, I had naval bases within close range of the United Kingdom. Germany invited Sweden to its alliance shortly after conquering Poland and declaring war on Belgium and the Netherlands. Though unprepared, I decided to throw my lot in with the Axis powers. The U.K. made quick work of my naval fleet, but Italy landed three divisions in the Greater London area of England. They were destroyed, but it drew British troops away from Scotland, where I launched my own invasion with 10 marine divisions, followed by reinforcements once the naval base was seized. It is important to gain and keep control of a naval base, to make sure supplies continue to reach your troops. Once I gained a toehold in Scotland, it was just a matter of time. Germany declared war on the Soviet Union in January 1941, when I had conquered the upper half of the U.K. The U.K. capitulated in April 1941, ending the war in Europe. Germany annexed Great Britain and most of Africa, Japan took the Allies’ eastern colonies, and Sweden annexed the Danish islands and most of Finland (besides Soviet claims). I made ready to join Germany’s war with the Soviet Union, but first I had to move divisions out of Great Britain and to the Swedish/Soviet border. By December 1941, I was ready with 18 mountain divisions, 15 infantry divisions, 13 marine divisions, and 6 armored divisions. Marines have a +30% attack in marshy terrain, which is scattered throughout the Murmansk region and parts of northern Russia. 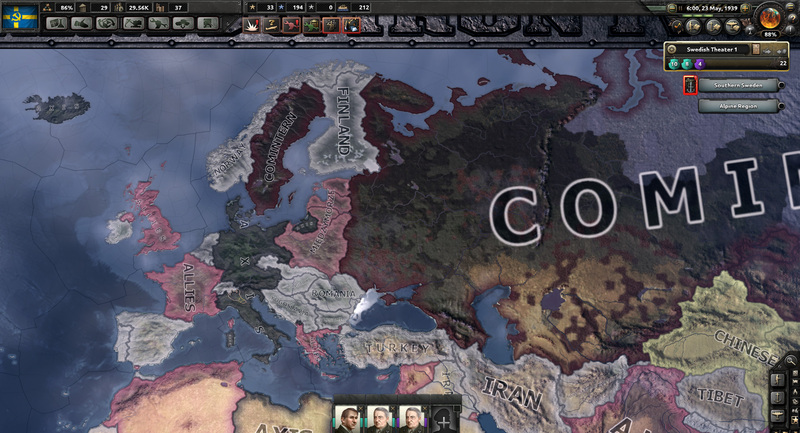 With the Soviet Union on the ropes, there was only one thing left to do, conquer the Baltic countries: Latvia, Estonia, and Lithuania, which the Soviet Union had not annexed under the Molotov-Ribbentrop Pact. The Soviet Union surrendered on March 17, 1942, and Sweden received Murmansk and a large colony across Siberia and northern Russia. The Baltic states fell, one after the other, by October 1942. This was the first time playing as a minor Axis country that the Allies have been defeated, and I have to say, I thought it would be more of a challenge. If the United Kingdom capitulated, I don’t think its colonies would have continued fighting (aside from local insurgencies), so that much rings true. I think Germany would have puppeted Great Britain, rather than annex it. In fact, they had plans to do so. The key to defeating the Allies seems to be conquering Britain and France before the United States enters the war. Once that happens, the industrial might of the U.S. tips the scales. The U.K. has few divisions guarding the home country initially, but the longer you wait, the more they stack in southern England. They also tend to spam fighter planes and end up with thousands over England and the English Channel. “The tides of history will sweep away the past.” The Swedish communist party executed a coup on December 14, 1936 after a rapid growth in popularity. The U.K. quickly began justifying war goals against the new regime. They declared war on February 25, 1937. After fending off a flurry of amphibious attacks, the Soviet Union invited me to its faction. I eagerly accepted, because I was out gunned and out numbered. The winds of war burned hot–Germany declared war on the Soviet Union in November 1938. Incredibly, the United Kingdom and Germany were now fighting on the same side! This was not a war I wanted or planned for… Stranger still, the U.K. declared war on Denmark shortly after. Italy allied with Germany, then declared war on Greece. The U.K. guaranteed Greece’s independence, so it declared war on Italy, dragging it into a war with Germany. All the major powers in Europe were now at war with each other, except for France. But France soon joined the Allies, dragging it into war as well. Denmark then joined the Axis! With Denmark now an enemy of the U.K., the U.K. could no longer pass ships and troops freely through the Danish Belts, so their constant amphibious invasions stopped. Sweden gained a much needed rest period to build up its navy. Near the end of 1939, the U.K. declared war on Norway and it joined the Axis. I made sure to enter into a non-aggression pact with them, as I had with Denmark. By April 1942, the Soviet Union had conquered Denmark and the Allies were halfway into Germany. Since I was not at war with either of those countries, I couldn’t decide whether this situation was advantageous. If the Axis powers capitulated, that would leave Sweden and the Soviet Union at war with the Allies. But if the Allies puppetted Germany or kicked the Soviet Union out of Denmark, that would open the Baltic Sea to naval invasion again. I didn’t have to wait long to find out. Germany capitulated in September. Despite my best efforts, the Allies soon gained control of most of Denmark and southern Norway. I learned the value of researching encryption and decryption too late and my submarine fleet had already been destroyed in futile efforts to raid Allied shipping. I was unprepared for the sheer number of Allied divisions and landing spots. They trapped half my army in southern Sweden, but I managed to save them via amphibious transport. I established a defensive line behind a river in central Norrland, but Allied troops were advancing north through Finland. Even with manpower recruitment at 30% (Scraping the Barrel +25%, Volkssturm +2%, Non-Discriminatory Conscription +3%), Swedish manpower reserves were quickly exhausted. The communist government surrendered on October 17, 1943. In retrospect, I was overly confident from my easy victory against the Allies in my earlier play through and forgot how powerful they can become. I squandered my navy by neglecting technology and left the long Swedish coast vulnerable to amphibious invasion. Early in the war, the U.K. was fighting alone. I should have attempted a naval invasion of my own, but waited too long to prepare. Also, be mindful that the U.K. will declare war on any Scandinavian country that threatens to become communist. Thanks for sharing this article. I love Hearts of Iron but I’m interested new ways to play countries; it’s always too tempting to go fascist and just start rampaging. Communist Sweden sounds like a fun game with some interesting diplomatic twists.